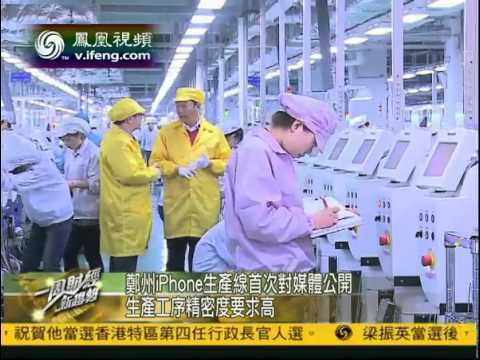 A video released on Friday gives outsiders a look at what goes on inside a Foxconn factory responsible for the manufacture of a large portion of Apple's iPhone stock including the newest iPhone 4S. In the video from iFeng (via The Next Web) a Chinese reporter takes a tour of Foxconn's expansive Zhengzhou plant where an estimated 70 percent of iPhones will be produced this year. The clip begins with Foxconn CEO Terry Gou taking the reporter on a helicopter ride over the 5.6 square-kilometer factory that houses 115,000 employees, then pans to a "wasteland" destined for expansions to the plant that is already the largest in the area. Inside the factory, Gou moves from production line to production line, starting first with the iPhone 4S and its display and ending with motherboard section which produces 10,000 units each day. The CEO boasts that the facility is the best in the world, besting fabs in Japan, Germany and the U.S. Finally, Gou moves into a dust-free clean-room where the handset's camera is put together. In addition to the factory tour, the video includes a few employee interviews that are unsurprisingly favorable of the company and its facilities. The report was part of a media day that may have been scheduled to help allay widespread criticism of alleged poor working conditions suffered by Chinese workers. The last inside look at a Foxconn plant was in April when American Public Media's Marketplace journalist Rob Schmitz was granted access to the company's Shenzhen operation. Schmitz's visit followed an inflammatory, and ultimately tenuous, story run by APM's This American Life in which orator Mike Daisey fictionalized the working and living condition of a Foxconn employee. mendacious . . . faked . . . made-up . . . lying . . . deceitful . . . misleading . . . sleazy . . . shameless . . . shameful . . . I couldn't make out a single word but I did notice the ending had the unmistakable rhythm of US journalists on location ending their report. Not quite. All he actually said was that the device has gone through numerous checks and quality tests and is ready to deliver to the customer after slapping on some tags. No journalistic "sign off" there. Pretty straightforward, to somewhat boring report. As above, it's just focused on showing the massive size of the new industrial area, the 140m production line and the very high quality OEM engineering that Foxconn is capable of. No mention of worker condition apart from we all can see in the video. That's nuts (the elaborate process of making the device). I applaud the people responsible for designing the equipment, programming automation of the factory and creating the equipment, moulds etc that are used to create the idevices and other electronics. At 2:20 is this the new iPhone? Seems like non-metallic finish and significantly thinner. I know what you are referring to, but it was a iPhone 4s part. Feels like a bit of a puff piece but still interesting to see inside. Shame there's no English subtitles. I should imagine there will be some other versions of this video with English sub-titles that don't match what they're actually saying before long. Can't wait! First guy: "Shall we take The Peoples' helicopter, or mine?" Second Guy: "Er....Let's take yours"
Considering that Apple chooses not to license their OS which makes it impossible for other HW manufacturers to use OS X in their systems directly I'm sure he's perfectly fine with it. Do you think Tim Cook sees a specialized industrial machine that uses Windows and says "We need to build that machine, regardless of how it will affect our bottom line, so MS can't get a Windows OEM sale."? I don't. The problem can go even farther than that. You switch the OS or put a Mac mini in an industrial enclosure, what software do you run? There might not be Mac versions of the software in question, and it might not be worth the cost of porting the software for a specialized use. So what else did you see when you toured the factory? Sorry, the smily was meant to imply my tongue was planted firmly in-cheek. Ah! Ai needs to fix this forum setup. None of the smileys show up. I assume that's a 5 minute fix unlike some of the other things like getting touchscreens devices to work with the forum's JS. typical of AI to only highlight apple positive news about foxconn, snubbing and bypassing the gritty truth that bad things HAVE happened at plants where foxconn were delivering 100% apple products. Not other vendors products, just Apple's. That's okay though, because there's this one guy, that lied. ZOMG, and that must mean reports of suicides, attempts, and mal-treatment of workers must be lies too. Oh, and here's a massively staged and bias video as proof! Oi AI.. you so funny. Typical of people like this not to give examples (and proof thereof) themselves, too. And I thought it was just something on my end (since most of the time I browse from work where our stupid proxy blocks everything)!